HUB Cycling is 20 years old! To celebrate, they organized a fun evening of inspirational speakers... including me! In case you missed it, here's my speaking notes & images from my presentation. 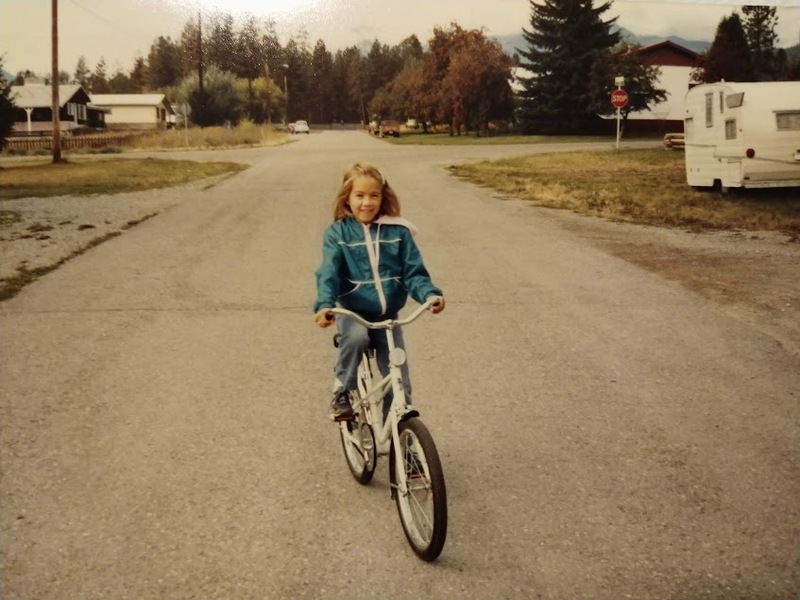 Biking on my street 7 years old. Photo by Stanley Jenkins. I'm going to go out on a limb & assume that everyone in this room knows the value of cycling to connect people to each other, to their city, to nature, to their own bodies. The value to public health & transportation. We know the joy of feeling the wind in our hair, the exhilaration of leaning into a curve, the empowerment of pedalling ourselves & our gear & sometimes our children on a camping trip. But when I look around at the schools where I teach, at the family biking workshops I've led, in conversation with friends, family & strangers, I realize that joy, that exhilaration, the empowerment isn't available to everyone. I'll admit, this isn't something I really thought about a lot until I started struggling with mobility myself. I fell in love with cycling when I was little & it’s been a lifelong relationship. In my 20s, biking, along with occasional car sharing & transit, became how I get around. It has been for most of my adult life & I didn’t see any reason to change that after starting a family. In 2010, my son was born & the following spring we joined the family biking world. Biking at 39 weeks pregnant. In 2013 I was pregnant again, & walking started to get really uncomfortable. I felt like my pelvis was going to fall apart if I walked across the street, but sitting on a bike saddle, I was fine. My bike became a mobility device. Biking was easier than walking, so I rode right up to the day before I went into labour with my daughter. After my daughter was born, I had increasing pain when walking & standing. My hip had been sore on & off for years, but never this bad. Finally, I got X-rays & just before I turned 40 I was diagnosed with osteoarthritis. This was a bit of a blow to hear the words “progressive” & “degenerative” applied to my body, & that the “cure” is total hip replacement surgery. At Robson Park. Photo by Melissa Bruntlett. 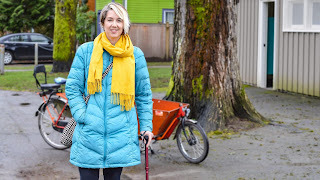 My doctor sent me to a physiotherapist at the Osteoarthritis Clinic at VGH where I was fitted for a cane, & learned what sort of physical accommodations I should start thinking about. I was really struggling with the idea that this wasn’t just a temporary injury, but a long-term disability. I was also struggling to walk across busy streets with two small children while using a cane. Biking has done a lot for me--when my doctor recommended I lose weight to help reduce pressure on my hip joint, biking was how I did that. Biking keeps those endorphins flowing & helps me manage the pain of my osteoarthritis, so I've used my cane very little except in winter the last couple of years. Tonya & I at the first Family Bike Fest. Photo by Tom Wiebe. As an advocate, an educator, an organizer, I believe my role is to help break down the barriers that stop people from biking. As does my friend, Tonya, who I met on a group bike ride. 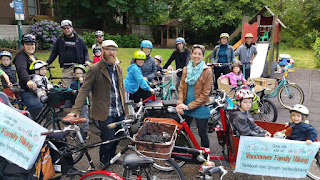 Over many cups of tea, we talked about how hard it can be for families to find reliable information or actually test ride the gear when they want to start biking with their babies & little kids. 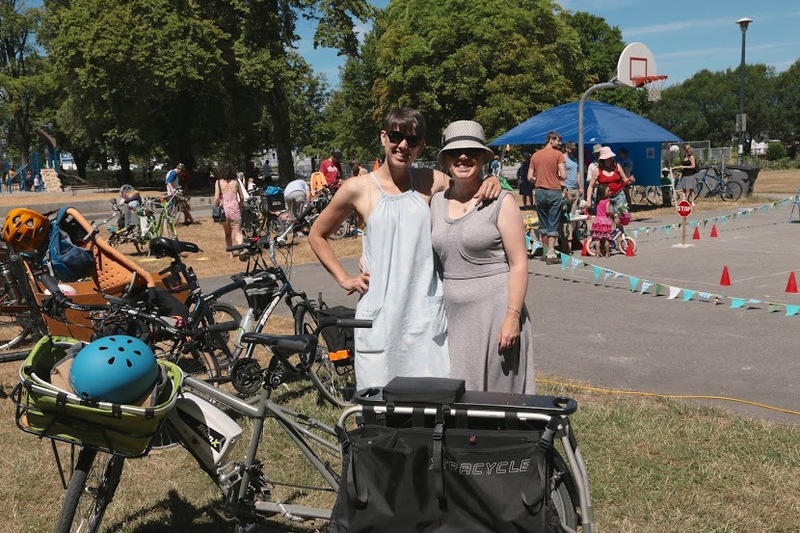 These conversations turned into to Vancouver Foundation grant applications & we organized two Family Biking Festivals as well as a series of workshops on family biking. 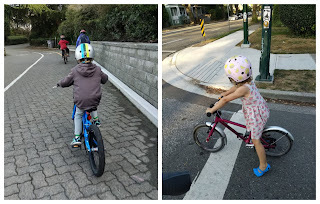 I also started promoting the Vancouver Family Biking Facebook group more & I'm proud to say it's grown from about three dozen people back in 2015, to a consistently supportive, active community of over 1300 members & a great place to crowdsource information. Vancouver Family Biking Facebook Group. 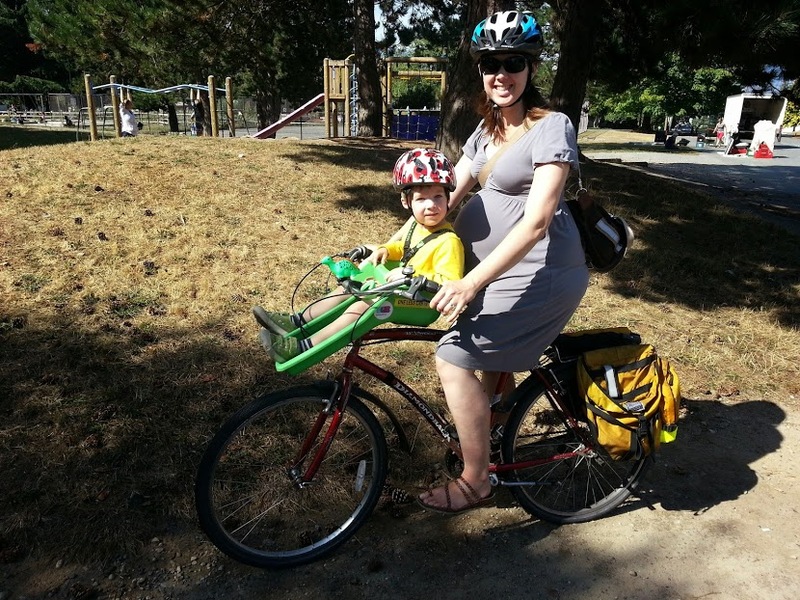 It was Vancouver Family Biking members I turned to last year when I heard about a Syrian refugee family who needed a way to carry their youngest child while biking. They'd been given bicycles for the other members of the family, but couldn't bring their youngest child with them without a seat or trailer. Staff at the Mount Pleasant Family Centre Society asked if I had any ideas & within an HOUR, I connected them with a Vancouver Family Biking member who donated her child trailer. With seven children, most of whom have to pay bus fare, the math just doesn’t make sense for a low-income newcomer family to get around the city. 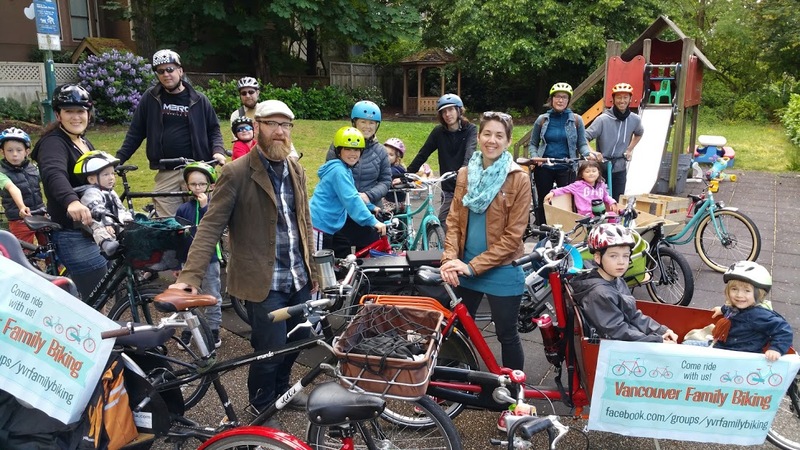 Biking means affordable mobility for them. There's a perception out there that cycling is only for the able bodied & healthy. The vast majority of those cyclists you might see from your car as you drive along the busy arterial roads do tend to be able-bodied men. Of course, those of us riding along the seawall & the quiet bikeways see another story. Accessible cycling: boy using adaptive bike, woman riding electric assist trike, senior passenger on the duet bike. We see the elderly woman riding the tricycle with her crutches in the back. We ride with our friend to the BC Cancer Agency to get her test results. We see a woman with a prosthetic leg zipping over the Cambie bridge bike lane. Or there's me, biking to an appointment at the osteoarthritis clinic. People with disabilities are a small part of the cycling population, but we exist. We need all you “healthy cyclists” to help amplify our voices, particularly in the municipal election campaigns when bike lanes get thrown around like a hot potato. Of course, disability is not only about physical mobility. 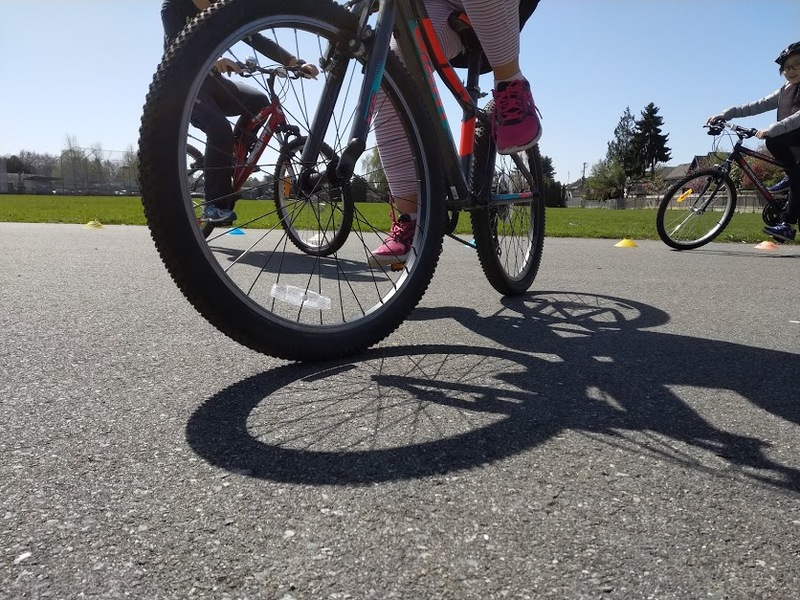 As a cycling instructor, I get to go into schools all over Metro Vancouver & meet kids who are usually pretty excited about riding their bikes instead of sitting in math class. But some of them aren't. In the past couple of years, I've learned to look for those wary faces, the uncertain faces. Sometimes it's just that they haven't learned to ride a bike yet. But often the barriers are invisible disabilities. As the parent of an autistic child, when I get into the classroom, I look for these kids. Like Jason, during the first day of the program I was teaching at his school in Maple Ridge, I found out that he hadn't yet learned how to ride a bike. I let him know that we would bring balance bikes & give him a chance to learn during the program, but he wasn't terribly enthusiastic about it. I was worried that he wasn't going to participate at all. The next day I saw him, I spoke to him again & discovered that he was self-conscious about his classmates watching him while he was learning to ride. So I explained that he & his teacher could go anywhere on the school ground that he liked if he wanted some privacy. 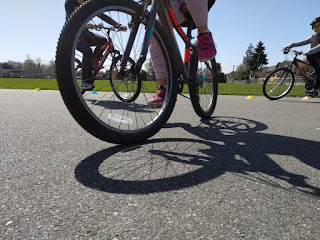 I was thrilled to see him move from the balance bike to a regular pedal bike & I got to watch Jason ride across the schoolyard with his classmates cheering him on. I get great joy out of helping people break down barriers that stop them from biking. 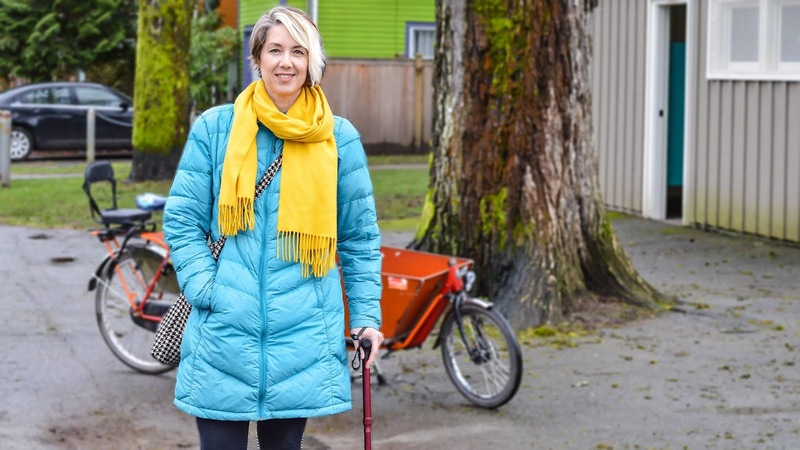 I love learning about all the resources that are out there, like Our Community Bikes & Kickstand, The Bike Host Program, The Buddy Up Tandem Cycling Club, the Vancity Mobi Community Pass & many more, so I can connect people with them. Linny biking the seawall; Bronte biking to the library. I’ve learned so much along the way from my own children, from Jason & all the other people & families with diverse needs that I’ve met in classrooms, board rooms, community centres, & parking lots where I teach. I try to plan & anticipate their needs as much as I can, but mostly I’ve learned to watch & listen. Ask questions so I can address their needs in a way that works for them. & keep asking. Keep inviting them to bike down those barriers. Aw, thanks for reading, Karen!